Fig. 2. Modulation of autophagy and intersections between autophagy and disease-associated genes as a therapeutic approach for neurodegenerative disorders. 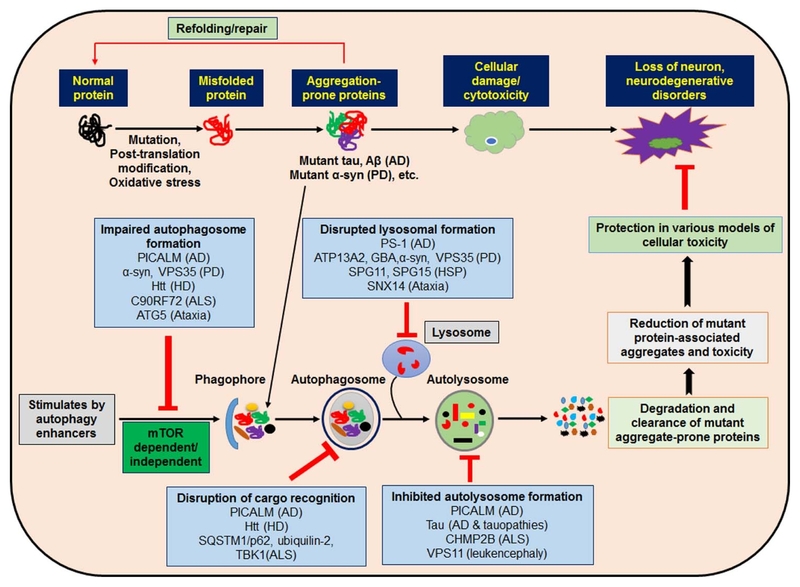 Impaired autophagy is involved in the pathogeneses of several neurodevelopmental and neurodegenerative disorders. Different cytosolic mutant and aggregate proteins are linked with neurodegenerative symptoms, which may predominantly be removed through autophagy. Pharmacological stimulation of small molecule autophagy enhancers may initiate autophagy via mTOR dependent/independent pathways that reduce mutant protein-associated aggregates and toxicity, leading to cytoprotection and rescue against neurodegeneration. Several genes connected with neurodegenerative disorders have now been associated with autophagy function. These genes perform a number of diverse steps throughout the autophagic cycle, from early steps of autophagosome development through autolysosome formation. Their proposed sites of action are now designated, along with the neurodegenerative disease with which they are associated.